If you have a Dante-enabled mixing console, the D400-Dante A-Net Distributor makes it easy to add a personal mixing system. 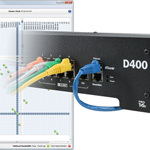 Here’s a look at the patching from the Dante Controller software (available from Audinate) into a D400-Dante A-Net Distributor. The D400-Dante can take up to 32 channels from a Dante network that can then be used to create monitor mix content for A320 And A360 Personal Mixers. 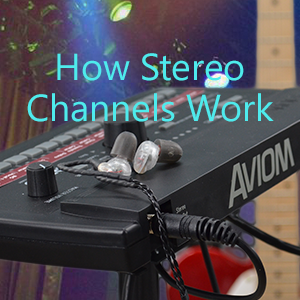 The first example is a straight-through one-to-one patch for a 16-channel monitor mix application. 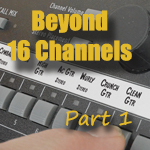 Channel 1 of the mixing console goes to input #1 of the D400-Dante and so on, up to channel #16. The Dante Controller software displays input sources across the top of the X/Y grid; destinations are shown vertically on the left side. Transmit channels (across the top row) are patched to the D400-Dante. But Dante offers a lot of patching flexibility; anything in your Dante network can be patched to any other device in any order. And that’s what is happening in the next example which uses 32 channels from the Dante network. The D400-Dante is getting some channels from the digital mixing console, and the rest of the channels from a PC that is running Audinate’s Dante Virtual Soundcard software that allows any DAW application to route its channels in and out of the Dante network. The dark blue cursor indicates that Input Channel 23 on the D400-Dante is being edited. Each subsection of the Dante Controller grid can be opened and closed as needed to show/hide channels. This makes managing a large number of inputs and devices easier to see on screen while editing. Simply move the cursor until the cross-hairs highlight the desired channel patch and then click the mouse button. The display shows a green check mark for the transmit device and another at the receive device when the channel is properly patched. Once you have your channels patched as required for your application, you can close the Dante Controller application and remove the computer connection if desired. You’ll only need to run the software again if you want to change routing; Dante devices remember their patching assignments across power cycles.